My friend and mentor Dave Foreman, author of Rewilding North America and other critical works, advises wildlands advocates to think of rewilding landscapes as an effort akin to putting together a jigsaw puzzle. You see the final picture, the vision, on the box cover. You put it together with friends, piece by different piece, over time, not quite sure how it will all fit together but remembering what is the final goal. 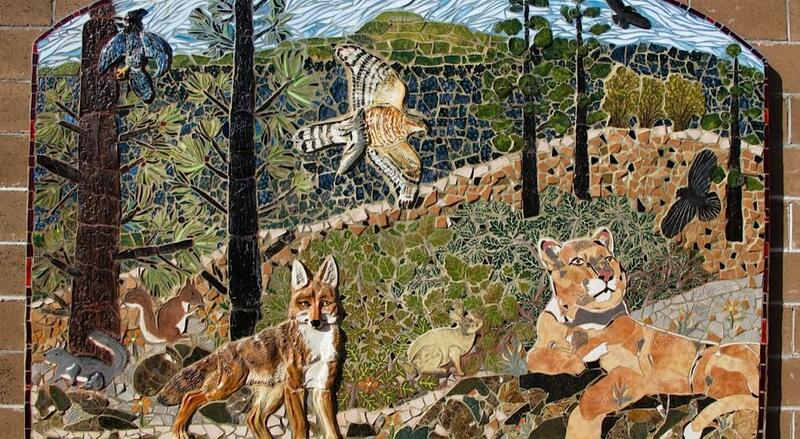 I think now, though, that other New Mexico conservationists may have come up with a more artistic metaphor for rewilding a landscape: a mosaic, or tapestry, lovingly crafted by artists and activists and naturalists and children. Members and members’ friends of New Mexico Wildways and kindred groups took me to just such a mosaic, or ceramic wildlife mural, on a wall north of Albuquerque, during my side trip into the Upper Rio Grande Watershed in late June. 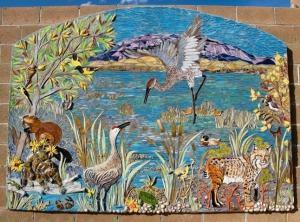 Artists and naturalists, from kids to seniors, have created on a neighborhood wall in the community of Placitas–a linkage area between the Galisteo Basin and the Sandia Mountains–a sequence of mosaics to remind New Mexicans for decades to come that they share this land with bears, foxes, cougars, bobcats, herons, eagles, songbirds, minnows, snakes, butterflies, and a rich native flora. We could viscerally feel the depth of spirit and love put into these mosaics, as Laura Robbins, Cirrelda Snider-Bryan, and their artistic conspirators explained their creation. Like one of these mosaics, this segment of TrekWest, my week-long side-trip back south into New Mexico, was way too rich in experiences, scenery, conservation friends, and wildlife to fairly represent in a short blog. For now, I just try to capture a few salient points. My guides included Jan-Willem Jansens, founder of Ecotone and coordinator of New Mexico Wildways; Katherine Eagleson, executive director of The Wildlife Center; and Peter Callen, coordinator of Pathways/Wildlife Corridors of New Mexico. The biggest point was made by my mentor and friend Dave Foreman in conversation with Jan-Willem, Kim Vacariu, and me: The pieces of the wildlands puzzle are being put in place – the landscape mosaic is being crafted – by grassroots conservationists statewide, with New Mexico Wildways, New Mexico Wilderness Alliance, Pathways, Wild Earth Guardians, Center for Biological Diversity, Sierra Club, Defenders of Wildlife, and others. The vision Dave and others painted in the New Mexico Highlands Wildlands Network Design a decade ago is far from complete, but great gains have been made. Indeed, as Jan-Willem explained, progress has been great enough that the Galisteo Basin, between Albuquerque and Santa Fe, may now be seen as a link rather than a gap for wildlife. Moreover, as Katherine Eagleson showed me, north of Santa Fe, wildlife connections from northern New Mexico into southern Colorado are still strong, largely along the Sangre de Cristo and Jemez ranges, but even along the Upper Rio Grande, too – thanks partly to one of President Obama’s greatest moves yet: establishing the 242,455-acre Rio Grande del Norte National Monument. 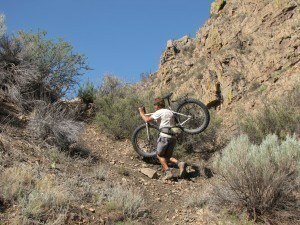 I experienced these connections by a busy combination of biking, hiking, and guided car tours. On my pleasant bike ride south from the Colorado/New Mexico state line to Chama, NM, I saw lands diminished somewhat by roads, fences, and livestock grazing but still probably permeable to most native wildlife. Curiously, prairie dogs seemed most abundant in the margins between roads and livestock fences, a sad trade-off – better forage but more roadkill. When Katherine and I walked the Sargent Wildlife Management Area outside Chama, we were delighted to hear many riparian birds, including yellow warblers, and to see ducks on the ponds built by beavers. The long hot bike ride through the Galisteo Basin (75 miles with a dozen stops at key sites in hundred degree heat) left my temperate body nearly dehydrated but my mind whirling with possibilities. In this sweeping look at the lowlands between New Mexico’s two great cities, I learned of how wildlife track & sign surveys (as pioneered by Sue Morse of Keeping Track), archaeological and cultural concerns (long histories here of Puebloan and Hispanic peoples on the land), conservation and limited-development designs, ecological restoration, education through wildlife rescue and rehabilitation, provision of safe wildlife passages, and other good tools are crafting a wildlife mosaic. Recent remote camera photos of bears and cougars and other carnivores and ungulates confirm that shy, sensitive, and wide-ranging animals are traveling this area. Even the Central Rio Grande Valley, long settled by and harnessed for people, offers hope of wild renewal. Friends and I spent a morning admiring ducks and turtles and flowers at the Rio Grande Nature Center State Park, then cycled a popular bike path south to the new Valle de Oro National Wildlife Refuge, where degraded agriculture lands are to be replanted in native floodplain trees. 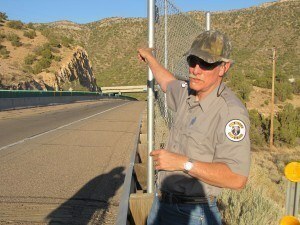 Mark Watson of NM Game & Fish shows us the safe passages for wildlife built into the Tijeras Canyon corridor of Interstate 40. One of the Rio Grande’s main tributaries, the Rio Chama, also still enjoys a surprising amount of wildness, as Katherine Eagleson shared with me on a driving, boating, walking, and swimming tour. Like almost all big Western rivers, the Rio Chama has been damaged by dams, diversions, and drought. The Rio Chama Flow Optimization Project though, has made a compelling case for dam releases to mimic natural floodplain-rejuvenating flows. Katherine and a young water ranger with the Army Corps of Engineers (yes, a real conservationist in the Corps!) took me to the tail flow area below the dam where a wetland project is being planned and an arm of the Abiquiu Reservoir that they hope to protect from motorboats. It’s a sad irony, but one we need to acknowledge for the birds, that we have so upset Western hydrology that some of the only remaining riparian and wetland habitats for native species are artificial, like marshes behind dams. Of course, I’d like to see the dams removed and natural conditions restored. However, until that miracle happens, maintaining some of the neo-natural habitats for native species may be the best we can do in altered environments. My final hike in New Mexico was with Jan-Willem down from Cebolla Mesa to the confluence of the Red River and Rio Grande, at the edge of the recently designated Rio Grande del Norte National Monument. The graceful flying yellow, red, and black of a summer tanager complemented the gray rock and blue river and sky. Along the rivers, anglers cast for trout from shiny smooth black basalt blocks. Jan-Willem told of the walk to this wild place with his wife the day after their wedding, in fresh snow 16 years ago; and I could imagine the storied tracks on the white palate: Coyotes and foxes trotting efficiently up and down river, a weasel bounding atop then plunging into snow for a mousy morsel, voles hopping hither and yon, heart-shaped deer hoof prints moving where green forage remained, and the expansive tracks of a young male cougar lighting out for the territory, north to the San Juans. Your kind consideration of a DONATION – all to help TrekWest inspire as many people as possible to support wildlife corridors and to keep up with basic supplies and equipment — is much appreciated.